On the way to the NRA convention, my friend Dennis and I wound up cutting through about twelve miles of Illinois territory and went through the main street of Cairo. The entire town looked like this or worse. The only buildings in good repair were government offices. 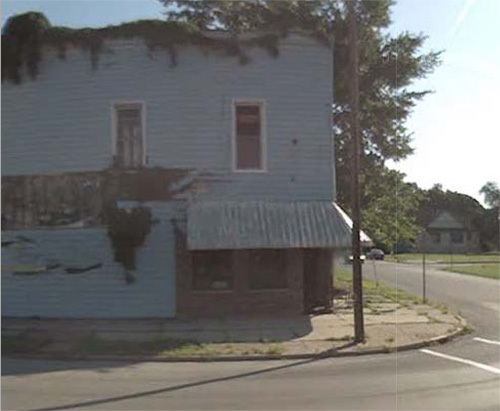 Most houses are dilapidated, with windows broken or boarded up. We saw only three people, two of whom moved rather furtively. The entire place reminded me of a post-Apocalyptic movie set, except that it was real. We didn’t have to stop the vehicle and so were spared the worst of it…I can’t imagine living in that town or that state, unarmed by law and trying to get through the day in an place that was depressed both economically and culturally. It’s bad enough that violent crime exists. It’s worse when the state government sides with the criminals and makes the rest of us easier to victimize. Not that Tennessee is perfect in that regard — we have far too many exclusions to legal carry and the law also discriminates against people under age 21, though they happen to be at very high risk of victimization relative to the rest of the population. But they can at least have the protective umbrella of older friends and family, whereas the residents of Illinois have no such advantage. This entry was posted in prey, red, rkba, self-defense and tagged carry, Illinois, victim. Bookmark the permalink. I never say “Carrying is illegal” or “Carrying a weapon for self defense is illegal”. 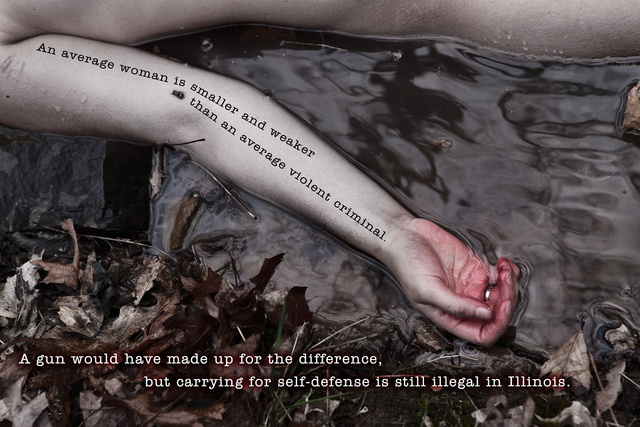 I always say, simply, such as “Self defense is illegal in Illinois”. The choice is to let the statement stand, or argue it’s wrong. Arguing it’s wrong always reaches the inevitable conclusion…. while someone might be able to say ‘Self defense is not illegal in Illinois”, they can’t get past that fact that HAVING the MEANS of self defense is illegal in Illinois. Substitute any state, city, or country that applies. Self defense is a human right. Being denied the lawful means to exercise the right is to be denied the right. Well put. I spent quite a bit of time in college studying linguistics and Chomsky, who’s a big lefty. But his theories are about shifting the language of the argument so that people are fooled by turns of phrase such as “gun control”, “gun-free zones”, “quality of life” and much of the “progressive” government double speak. People must shape the argument in words that make plain what the statists are trying to obscure with their rhetoric. Trying hard to get the future wife out of there….as fast as possible. I have read that the collusion is actually pretty close (genuine but hidden) between the gangs and some of Chicago’s city government (which is the problem here in Ill-i-noise). As a photographer, I bet you’d find where I live visually interesting, in a run down kind of way. Some places can get really spruced up, and have property values practically triple with a can og gasoline, match book and a little work. Although you may not have noticed it, you went through a place that is probably worse than Cairo. East St. Louis has, according to the FBI, the highest crime rate in the US. As of 2007 101.9 murders per 100,000 residents. Here in NH I had a student in an NRA Personal Protection In the Home class who was a trauma doctor who had worked in an ambulance there and then worked in the ER at Barnes Hospital. He had a wealth of detail that he was able to contribute to the class on the effect of bullets of various calibers and types on the human body. East St Louis is just on the IL side of the Mississippi. The highway you probably took went through it. No firearms for self defense unless you are willing to break the law. Those in the rural areas of IL are under the political thumb of the population concentrations in the cities, in particular Chicago where I grew up. The State came up with a slogan “Just outside Chicago, there’s a place called Illinois.” that was intended to encourage Chicago area residents to vacation in IL rather than going to WI or MI. However, informally, it became a slogan emphasizing the divide in the State. Many outside of the Chicago area do not consider Chicago part of their IL. Unfortunately, politically, it is. We went around ESTL. Avoidance, when possible, is the standard practice. My wife and I are from Illinois (yes, it’s a good place to be from.) My Aunt and some cousins live not far from Cairo (rhymes with K-air-ro). Cairo has always been depressed—probably since it was a large Union logistical site during the Civil War. It never amounted to much due to the yearly floods from the Mississippi and Ohio rivers. Cairo was/is the classic farming community. Because of the flooding, industry, heavy or light, never took root. When the levee system was built in the 1930s by the WPA and CCC, there was a short-lived economic boom. As soon as that artificial inrush of funds stopped with WW II, Cairo went back to being the backwater it had been. Cairo isn’t unique. The entire southern tip of Illinois is in the same situation. Cairo is just the worst example. It could have been different. But, given Illinois politics and the state control by the Chicago political machine, Cairo is just another piece of downstate Illinois to be milked dry, and then tossed aside. That’s one heck of a moving poster. Its, perhaps, a bit too disturbing for FB, for me, but it is quite powerful. Today, April 19, is the anniversary, 1775, of the Battle of Lexington and Concord. The first shots and first actions and the first deaths of the American Revolutionary War. The war for our freedom. All who fought for our rights that day. And today far to many of us Americans forget. Today we still have to fight everyday day for our freedoms. Illinois is one example. Why in the world do you people live in/near places like that? I was in downtown LA the day of the Rodney King riots. I was very close to killing bad people when I had to stop for gas on the way home. One year to the day after that, my family lived in Colorado. It cost money and lost time for the rebuilding of careers but it was the best sweat/work/money my wife and I ever spent. Vote with your feet people. While you still can.